Deck the Halls: George W. Vanderbilt's inaugural holiday party in 1895 welcomed 50 guests to the newly completed Biltmore House. Today's elaborate Christmas production at the estate enthralls hundreds of thousands of visitors each season. Here we take you behind the scenes to see just how the celebration unfolds. Each room, including Mrs. Vanderbilt's, is given special care in during the decorating process. Christmas arrives early at Biltmore Estate as a freshly cut Fraser fir from the High Country reaches the lodge gate before dawn. In truth, preparations for Biltmore’s holiday pageantry go on for much of the year, with planning as far ahead as five years. The results are always awe-inspiring: thousands of twinkling lights, hundreds of ribbons and bows, more than a mile of garland, and dozens of artfully decorated trees inside the mansion and spread across the grounds. Lavish hospitality has been a tradition here since George W. Vanderbilt welcomed his first guests to the house just before Christmas Eve in 1895. It was a party that lasted two weeks. Archival records show that “Mr. Vanderbilt requires enough fish to make a course for fifty people every day, and lobsters for the same number twice a week,” and that extra farm-fresh supplies of black walnuts, chestnuts and other nuts, eggs, celery, and honey be laid in. That Christmas, hundreds of estate staff were feted in the banquet hall with a selection of fruits and ices, and received gifts distributed by members of the Vanderbilt family. After George married, his wife, Edith, continued the custom. These days, as many as 300,000 take in the splendor during the busy holiday season, from November to the New Year. And many of today’s roughly 1,800 Biltmore employees pitch in to transform the estate into the glittering holiday version of itself, involving numerous departments from engineering to housekeeping to museum research. And for employees and their families, the highlight remains the private Christmas party at the mansion, when each child still receives a present. Now, let’s step behind the scenes to see how the magic takes shape. Local pride belongs to a stately Fraser fir from Avery County selected for the banquet hall. Halfway through the holiday season, it will be swapped out with a look-alike to comply with fire regulations. Also displayed in the house are 220 poinsettias, grown in the estate’s greenhouses. In all, about 1,000 blooming plants are used indoors during the Christmas season. White pine, boxwood, and holly for the garlands and wreaths are replaced weekly for freshness, and 130 kissing balls of white pine and Fraser fir deck the halls. For many years, the large trees have been grown for the estate at family-owned Andrews Nursery in Newland. The giants may be 30 years old, stand 35 feet tall, and weigh up to a ton. George Andrews and his son, Greg, have perfected the art of shaping the trees in a shaggy, natural countenance appropriate to 1895. Bundled for protection, the tree is loaded on a flatbed truck for the journey. Once inside the gate, the tree is transferred onto a horse-drawn cart that Santa Claus rides to the front door. Hundreds of visitors purchase tickets for this festive day, when carolers set the yuletide mood. Then, in a grand procession, 30 to 40 Biltmore workers use stout metal poles to lift the tree and carry it inside. Each year’s extravaganza is a systematic, multi-year rotation of 50,000 ornaments, which bedeck the 50 or so trees that grace the mansion. Some decorations are imported from afar or, as in the case of the enormous shiny globes, are located by specialists in New York and Atlanta. Others are crafted by local artisans, while components such as dried flower arrangements are made in the estate’s workshops. A typical 14-foot tree holds 400 ornaments, and can take 40 hours to plan and decorate. Floor to ceiling shelves in a storage warehouse hold all those, plus bags of hand-tied bows, tablecloths and runners, and nativity scenes. “We really want to inspire people, to get them excited about Christmas and give them ideas,” says Cathy Barnhardt, the estate’s floral displays manager, who is working on her 34th Biltmore Christmas this year. Planning begins each December for the next year’s display with a room-by-room evaluation by the floral design team. In mid-summer, the designers take stock to assure they’ll have all the necessary supplies and accessories before they begin labor in the fall. Decorating the mansion takes place in layers and often in the pre-dawn hours before visitors arrive each day. First come any artificial trees, garlands, and wreaths, then lights, ornaments, and finally live plants. An army of Biltmore employees begin a decorating blitz as soon as the towering Fraser fir enters the banquet hall. The whole show is on view to visitors, as long as they stay behind the velvet ropes. All stands at ready: scaffolding, protective sheeting, ropes, lumber, burlap, lights, hooks, poles, and hundreds of jumbo ornaments and wrapped boxes. The effect is electrifying for the lucky few who get to watch. A gold star is placed atop the tree before it’s muscled into an upright position with ropes and stabilized. While some workers construct a stand around the base, others unwrap the tree and fluff the branches. The scaffolding is wheeled next to the tree and 500 lights are quickly strung. Then, working from the trunk outward, the decorating team of 12 to 15 people fills every available space using 500 colorful ornaments and 500 wrapped packages. The pine needles are swept away, and the intoxicating fragrance of Christmas fills the soaring, 70-foot hall. It’s all over in two hours, and the oak banquet table is moved back into place and decorated with gorgeous centerpieces. Incredibly and unbeknownst to most visitors, the first fir is stripped of ornaments and lights and removed in early December, and a second tree is brought in and decorated in the middle of the night. The big day has finally arrived for the staff: a Christmas party just for them and their families. This event has been a tradition for more than a century, and honors the Vanderbilt family’s close ties to staff. For many, this event is the first time all season they’ve seen the house fully decorated or without throngs of visitors. Biltmore Company president and CEO Bill Cecil, Jr., who is also George Vanderbilt’s great-grandson, savors the moment. “We can take a deep breath and enjoy the property for ourselves,” he says. Cecil takes a few minutes to address the crowd. Then comes the much-anticipated moment when the children receive their beloved presents from Mr. and Mrs. Claus. Let there be lights! As autumn gives way to winter, the Christmas spirit at Biltmore Estate reaches to the far corners of the property, radiating from the mansion into the landscaped wonderland of this spectacular urban countryside. In addition to some 30,000 lights used inside the house, another 125,000 mini-lights are placed elsewhere on the estate for various candlelit features, and there are 12,000 larger lights installed at the new Antler Hill Village and across the estate. The mansion’s front lawn also gets special treatment to highlight the façade and the allées of poplar trees. Three hundred luminaries line the approach, producing a warm glow in the evening hours. Each white paper bag holds a candle and is set out daily for the entire season. In addition to the many evergreens inside Biltmore House, estate workers will prepare and place dozens of trees on the estate, including a nearly 60-foot Norway spruce on the front lawn. Once Christmas and New Year’s have passed, it takes Biltmore staff about four days to clear the house of decorations and another 10 days to remove the remainder throughout the estate. 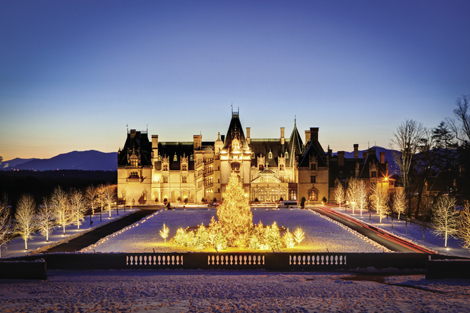 “Of course, we then spend a few weeks packing, sorting, and shelving the decorations and display materials in our warehouses,” explains LeeAnn Donnelly, Biltmore’s senior public relations manager. As soon as they are safely tucked away, the planning begins anew.